Wow a light that can give you personality! Sign me up. DO YOU GLOW WITH HEALTH? Some people are dull, drab, uninteresting and sickly! Others are vital, compelling and magnetic! WHICH ARE YOU? It is all a matter of vitality and health. The greatest discovery in years is that of VIOLET RAYS, electricity in a curative, medical form. Violet Rays put new life into over-taxed and sluggish tissues; penetrate and invigorate all the muscles and nerves of the body; give new tone and vitality to the entire body. Learn how you can multiply your energy and vim! Learn how to banish those pains, aches and ailments that run down your system, drain your personality and ruin your looks. WHAT IS PHYSICAL MAGNETISM? It is PERFECT HEALTHâ€”plus the keen mentality based on perfectly balanced nerve centers. We will be glad to send you on request the most interesting book ever published on this subject. Send for Free Book and Free Trial Offer! Take twenty Vi-Rex Violet Ray treatments in your own home. These treatments would cost you $50 to $100 at your physician’s or beauty specialist’s. 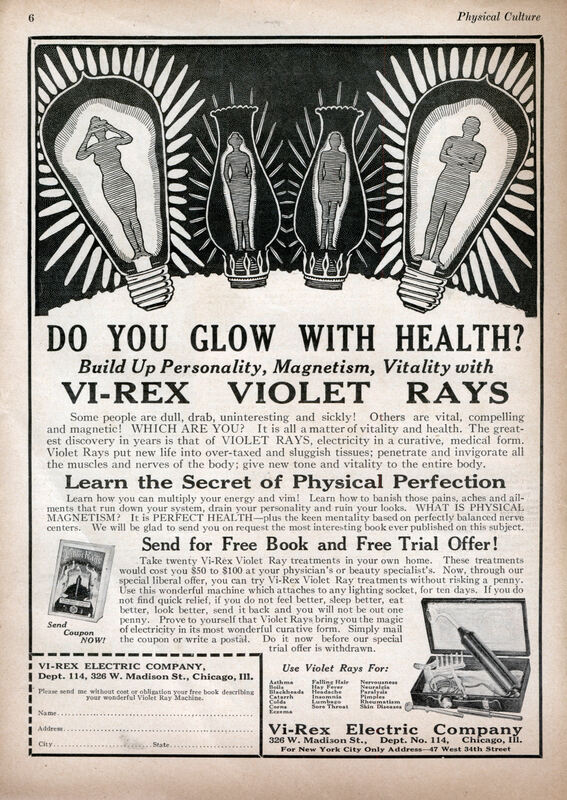 Now, through our special liberal offer, you can try Vi-Rex Violet Ray treatments without risking a penny. Use this wonderful machine which attaches to any lighting socket, for ten days. If you do not find quick relief, if you do not feel better, sleep better, eat better, look better, send it back and you will not be out one penny. Prove to yourself that Violet Rays bring you the magic of electricity in its most wonderful curative form. Simply mail the coupon or write a postal. Do it now before our special trial offer is withdrawn. 326 W. Madison St., Dept. No. 114, Chicago, 111.